We might not think our skin tastes good, but dogs tend to like the salty taste – and love being so close to the scent of their human. Further, we humans tend to react when a dog licks us. We might pet them, say something about puppy kisses, or tell them to stop. All these things show the dog that licking leads to attention. Attention is good, thus, I must lick more! Dogs also sometimes lick to show submission. This is particularly true when a dog licks another dog’s muzzle. 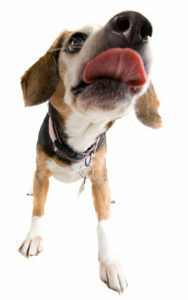 An interesting fact is, a dog’s licking is believed to release endorphins, so licking is its own reward, making them feel good.